For rental options, click here. 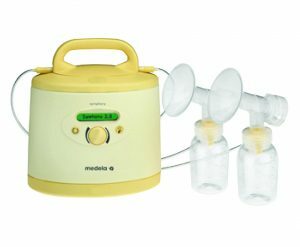 Symphony is Medela’s latest innovation in hospital-grade electric double pumps. With breakthrough 2-Phase Expression pumping, Symphony is proven to reduce pumping time through faster let-down and milk flow and remove as much milk as a breastfeeding baby. Symphony implements the results of extensive research on electric breastpumps initiated by Medela and conducted by internationally renowned lactation researcher Peter Hartmann, Ph.D.
2-Phase Expression® technology: Designed to mimic a baby’s natural nursing rhythm. Two separate, independent membrane units: Allows switching between single and double pumping by simply applying or removing the second collection kit to the breast. Let-down button: Moms can easily return to stimulation by pressing the let-down button. Initiate and maintain milk supply: If direct breastfeeding is not possible, as well as collect breast milk at work or during other absences from the baby. Hospital grade (multi-user): The pump’s kit is separate from the pumping mechanism and protected from overflow by a specially designed membrane. Bottles: Any standard size mouth bottles (Medela, Evenflo, Playtex, Dr. Brown’s, etc). Milk Storage Bags: Medela Pump and Store Bags, Kiinde Storage System, Babies R Us Storage Bags, etc.